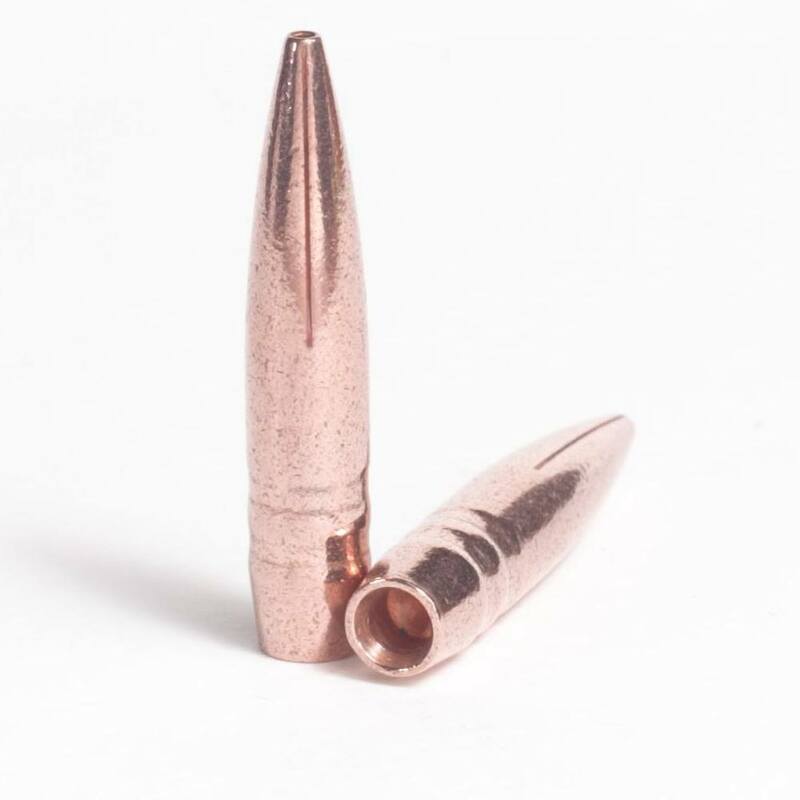 A projectile that’s currently getting a major buzz in professional hunting circles is the a copper bullet called the “Cavity Back.” They are CNC-turned, precision tactical/match target copper alloy projectiles that open up to over 2.5 times caliber once expanded. Simply put, due to a cavity in the back of the projectile, these bullets are hitting harder, faster and with more accuracy than almost anything else currently on the market. To learn more about the bullet’s unique design, we reached out to the Cavity Back inventor, Robert DeBell. Q: Robert, I talk with a lot of hunters, some of which are in the professional eradication business. A name I keep hearing over and over again lately is “Cavity Back.” Can you tell us about your background and how this design came about? Robert DeBell, Cavity Back Bullets: My background is, I have no real ballistic training background…just a lot of mechanical stuff. Now, I do the ballistics work for a company called Machine Gun Armory out of Salt Lake with belt-fed machine guns. But, I was shooting ARs a lot. And for hunting, I really got into the 6.8 SPC, like what Todd Huey shoots. In the course of shooting a lot with the 6.8, I found that a lot of the bullets were simply inadequate. For example, I was shooting deer with 95 grain TTSX Barnes bullets…I don’t want to bash the bullet, but they just don’t open all the time if they don’t hit something substantial. I had a lot of pass-throughs with it, where you could just put a pencil through the deer. Of course, the deer would run off, and hopefully I would find it. But after more than a few of those experiences, it led me to look at a better bullet. 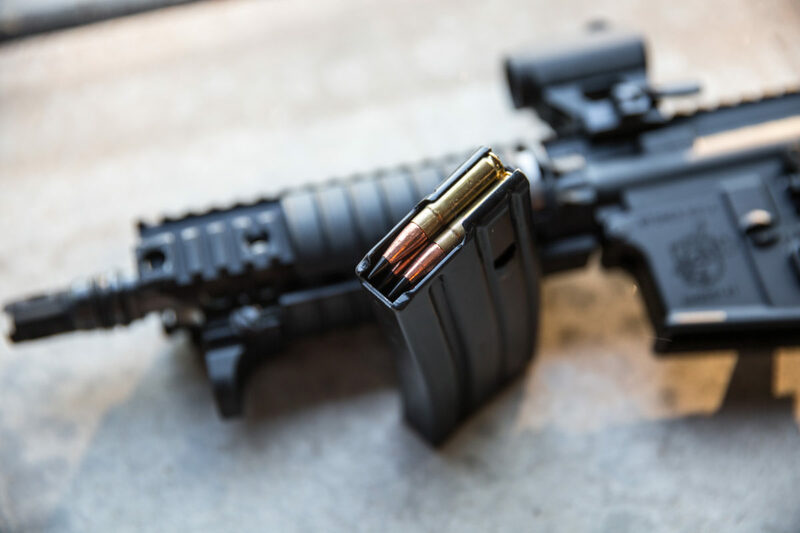 One day I was driving to work, and I came up with the idea of putting a cavity in the back of the bullet to try and push the bullet faster in these smaller cases that can be a challenge as far as case capacity. 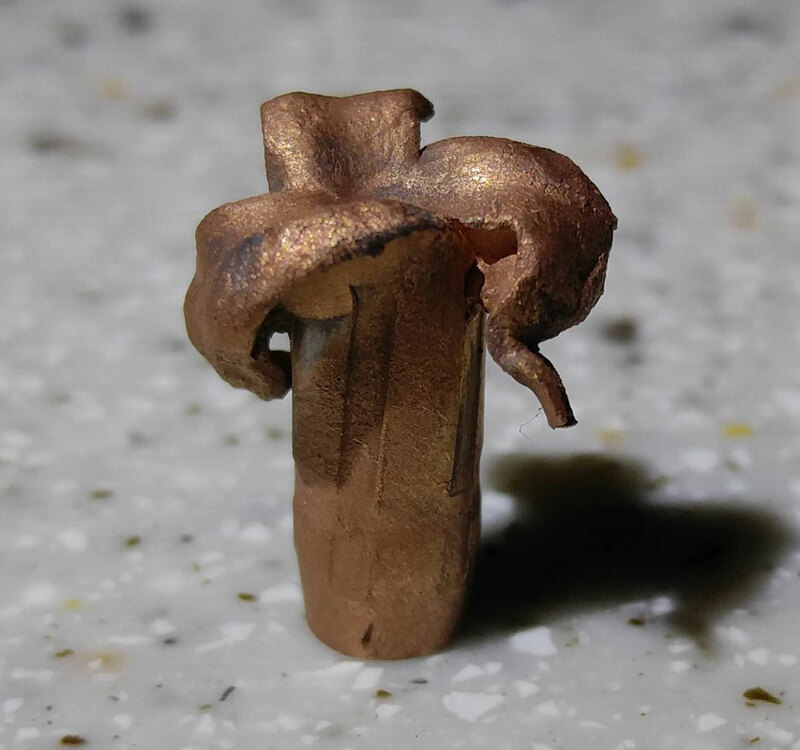 So, I modified somebody else’s copper bullets, and I took them out to the range and I found out that the idea worked. 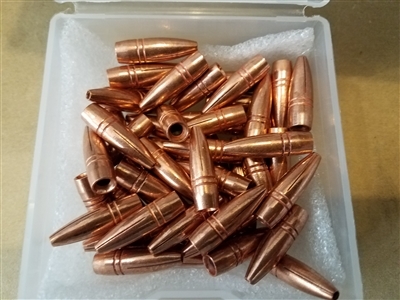 With the cavity…in cases that are challenged with case capacity, I can push a copper bullet as fast or faster as a lead-core jacketed bullet at the same overall cartridge length. Typically, you can’t do that because, the copper, being a lower specific gravity, is longer. It takes up more area in the case, which eats up powder capacity. Q: So, your idea seemed to have legs…What was the next step? Robert DeBell, Cavity Back Bullets: So, once I found out this idea actually worked, then I went to have the bullets made by another manufacturer. Then we started to work on the expansion qualities of the bullet. Actually, we looked at a lot of different things…the expansion capabilities, making copper bullets go just as fast as a lead bullet in application, and then lowering the engraving friction on the projectile too. And because the Cavity Back is a turned, CNC-milled bullet, they are more precise too. The ogive is the same…exactly where it is supposed to be. I can also set the expansion. So, I can take a particular bullet and make one variation of it expand from 2,000-3,000 feet per second, but then I can take another variation of it and have that one expand from 2,500 down to 1,500 feet per second. So, it’s a lot different than many other bullets in that I can set the expansion speeds wherever I want to. 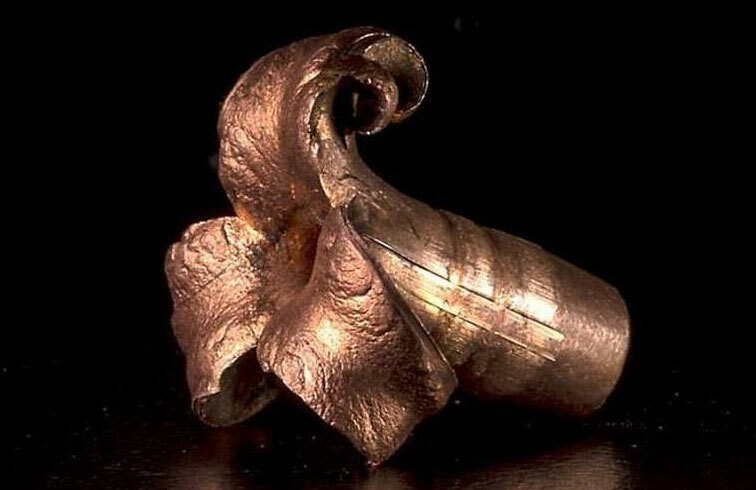 With the high expansion, the three-petal design, being able to push the bullet faster, we end up with a bullet that is more lethal than almost anything out there. Todd Huey would tell you, the guys at Tactical Hog Eradication…they’ve tried the other copper bullets out there, and they don’t come close to what the Cavity Back does. Once the animals are hit, they go down. Q: Curious..What does “MKZ” stand for? 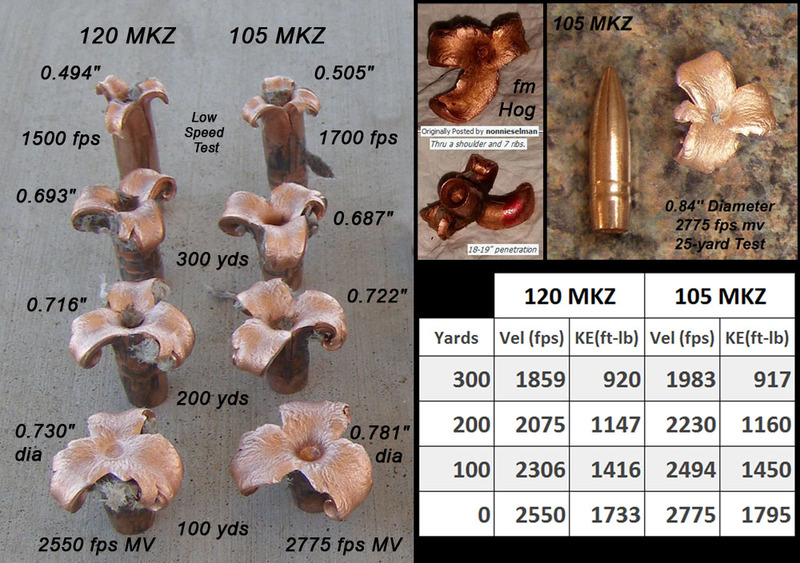 Robert DeBell, Cavity Back Bullets: ﻿MKZ means “Maximum Kill Zone.” There’s a lot of bullets out there with a lot of names. Trying to find a name that isn’t taken can be difficult. It’s kind of funny, I actually saw a Lincoln MKZ drive by and that’s where I got the idea. (laughs). Q: I know there are other benefits to the Cavity Back design, can you talk about those? Robert DeBell, Cavity Back Bullets: There’s a couple of things that happen with a cavity in the back of the bullet. First, it increases the square area that the powder column pushes on, this helps the bullet get moving faster and mellows out the powder spike. So, in other words, you can push them farther than what you would typically be able to push other projectiles. The other thing that happened that we didn’t expect…these projectiles are a match grade hunting projectile…but the 118-grain 6.5 Grendel that I make, it will fly within an inch of a 123 ELD that Hornady makes out to 1,000 yards. So, it’s an open-tip, high expansion, match-grade hunting bullet that will stay inside .7-MOA at 1,000 yards. That’s inside 7 inches at 1,000 yards with a hunting bullet. So, one thing you’ll never have to worry about with the Cavity Back is accuracy. What we found is, in the technical aspect of it, is there are two things that affect flight of a bullet. One is the center of gravity, and the other is the center of pressure. As the bullet speeds up, the center of pressure moves back to the ogive, towards the back of the bullet. As the bullet slows down, the center of pressure moves forward on the ogive. One of the reasons bullets have problems going through the trans-sonic zone, like the 168-grain Sierra…where a 170-something grain bullet doesn’t, is because of the difference in the weight of the bullet between the center of gravity and the center of pressure. That particular bullet becomes unstable as it goes through the trans-sonic zone. Because our bullet shifts the center of gravity toward the center of pressure but does not put it in front of the center of pressure, our bullets are more dynamically stable as they go through the trans-sonic zone. So, that’s another thing we found. All, bullets when the leave the bore…they yaw. Our bullets tend to yaw less because the center of gravity is closer to the center of pressure than another other bullets. So, that’s a side benefit when it comes to accuracy that we didn’t even see coming. Another effect of the cavity is something called “bore blast”. There’s a few different terms for it, but basically, as gasses are trying to escape around the bullet as it leaves the bore, the gasses are going faster than the bullet…that’s why the bullet moves down the bore. The cavity helps disperse these gasses into a wider cone angle. So, when the bullet does leave the bore, it’s not encountering as much turbulence. Q: I’ve heard a lot of buzz, but how has the reception been so far from what you’re hearing? Robert DeBell, Cavity Back Bullets: The field results, conferring with world-class ballisticians…is that they work. Everything they say they do…they do. We’ve never had one complaint in the field. Our biggest problem is simply getting the word out there. They kill faster. They drop animals faster, as they make game bleed like a broadhead, but without destroying too much meat. They’re also barrier-blind. So, if you were going to shoot through a car door or windshield in a tactical situation, there are advantages to using it…again, advantages that we did not necessarily anticipate. Q: What about if we’re not reloaders…any chance of factory loads coming out? Robert DeBell, Cavity Back Bullets: ﻿S&B is looking at our 195-grain subsonic 300 Blackout round…and our 125-grain. Our 125-grain is open-tip and not a tip like the 110-grain Barnes. It actually expands more and does a better job out of a 300 Blackout than what the Barnes bullet does. Barnes 110-grain…for many, including the author, this is still the king-of-the-hill for a factory-loaded hunting/defense round in 300 Blackout. In the 300 Blackout, we can push that 125-grain Cavity Back bullet almost as fast as you can push a 110-grain Barnes bullet. Because of the cavity and all of the things it does with powder capacity and everything else I mentioned, we’re getting 100 feet per second faster than any other 125-grain bullet out there out of the 300 Blackout, which is huge in that cartridge. 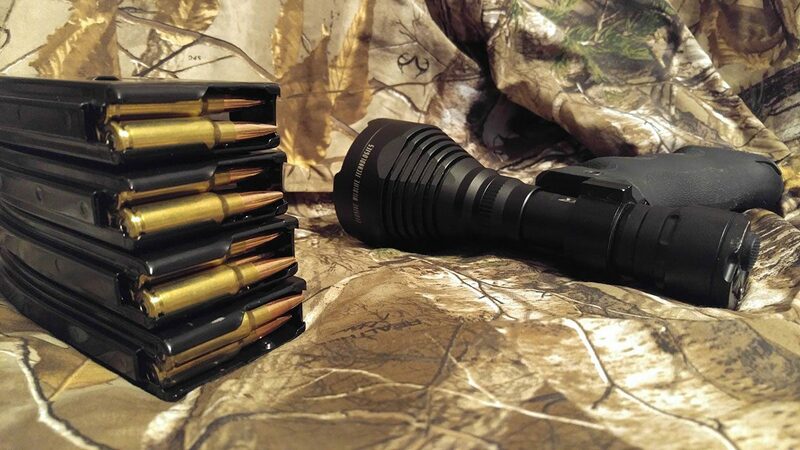 So, we’re doing 300 Blackout ammo…that’s going to be coming out. We’re also doing 6.5 Grendel ammo, 6.8 SPC ammo…those will be the first three that hit the market. They should be coming out mid-summer. We want them out before hunting season. Q: Can we talk a bit more about the 6.5 Grendel bullet? We’re seeing a lot of AR builders turn to it for hunting purposes. 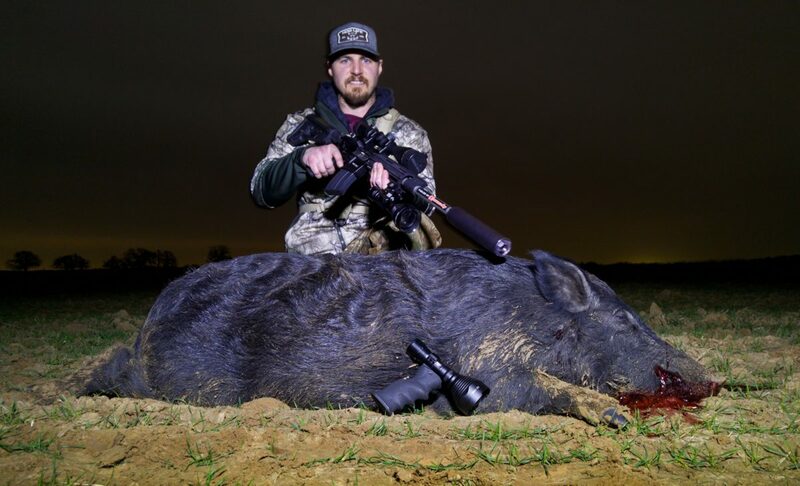 Robert DeBell, Cavity Back Bullets: ﻿The guys at Tactical Hog Eradication, while we have the 118-grain Cavity Back bullet, when they use the 6.5 Grendel, they are using our 105-grain. They like the 118-grain too, but the 105 just shoots flatter, faster, and still has the high expansion characteristics. It’s dropping hogs right and left. The one thing about the Grendel is everyone keeps trying to do a 123 or a 130-grain. It just doesn’t have the case capacity or the pressure handling abilities for it. So, we have a bullet that shoots flatter, faster, expands more and kills better. Now, everybody touts the Grendel as a 1,000 yard cartridge, and sure, it will do it…it’s got the capability for it, but it is kind of a rainbow compared to the Creedmoor or something, right? There are better tools for the job. But it does do the job well in an AR-15. Of course, the 224 Valkyrie is doing a better job of it now. But, we’re bringing out Grendel ammo for guys that are using it. I think our ammo is like a potato chip. Once you try it, our customers keep coming back for more. I’ve got guys that are buying a LOT of this stuff. We send a lot of stuff into Texas. And once these guys try it…they come back for more.